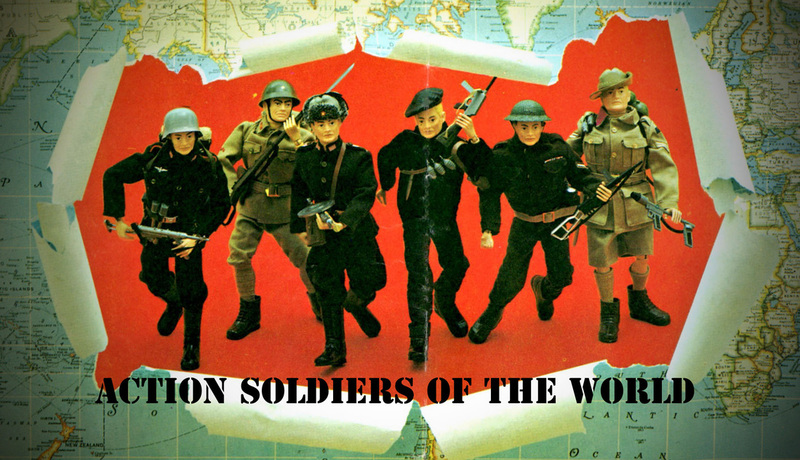 Introduced in 1966, the Action Soldiers of the World series brought international flavor to the line, and provided GI Joe with some allies and potential enemies. Patterned after authentic World War II era uniforms and equipment, these fighting men were sold in two forms: large deluxe window boxes, or smaller boxes that contained just the figure, uniform boots, and helmet. These small boxes could be fully kitted out with the addition of the appropriate accessory card, sold separately. Large boxes contained a bonus information and advertising booklet that Hasbro called the Counter Intelligence Manual. Figures had either blonde, brown, red or black hair, except for the Japanese figure which always has black hair. Though popular with collectors today, Hasbro apparently produced more of these sets than they could sell, and surplus foreign style heads were used on some of the talking figures released in 1967. Uniforms for many of the foreign figure were also used elsewhere. French sets dressed some 1969 Adventurers, and the 1970 Talking Adventure team Commander has been found wearing Russian, British, and German uniforms. The Japanese uniform occasionally shows up on 1970 black Adventurer figures. At the end of the line some backing cards and uniforms from the large boxes were remaindered under the company name "Tucket Toys."